If you edit a global row, column, or module using any of the three methods below, the changes are applied everywhere on your website where that global row, column, or module is used. If you edit a standard (nonglobal) saved row, column, or module, the changes are applied to any row, column, or module you insert into your layout from that point forward, but it doesn't affect any previously inserted ones. Use Method 1 or 2 to open a standard saved row, column, or module for editing such that the changes are applied going forward. Use Method 1, 2, or 3 to edit a global saved row, column, or module such that its changes apply to all existing global instances and all future uses. You can edit any saved row, column, or module, standard or global, directly from the Beaver Builder editor. In the Content panel click the Saved tab. You'll see a list of saved rows, columns, and modules. Mouse over the saved item you want to edit, then click the Wrench icon, as shown in the following screenshot. The saved item opens in a new browser tab. Make your edits, then click Done and choose whether to publish, save, or discard the edits. See Section 2 below about what happens with each choice. The Beaver Builder admin panel (or the Builder admin panel in versions prior to Beaver Builder 2.1) provides a very convenient way to manage your saved rows, columns, and modules. In the WordPress admin panel, click Beaver Builder (or Builder), then choose Saved rows, Saved columns (as of Beaver Builder 2.1), or Saved modules. If you don't see Beaver Builder or Builder in the WordPress admin panel, see the Related Article on enabling the Beaver Builder admin panel. Mouse over the saved item you want to edit and click Beaver Builder (or Page Builder prior to Beaver Builder 2.1). The saved item opens for editing in Beaver Builder in the same browser tab. 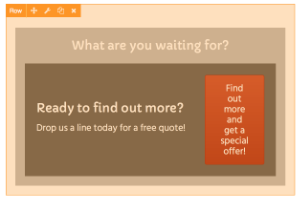 If you have an instance of a global row, column, or module in your layout, it appears with an orange overlay. If you open it for editing in your layout, make changes, and save the item, the changes are reflected in the saved item and also wherever else that global module is used. After you've made your changes to the saved row, column, or module in the editing tab, click Done in the upper right corner. The choice of whether to publish or save changes can be a little confusing in the case of saved objects, so here's a table to help. Publish changes Updates the saved row, column, or module and closes the editing tab. No effect on existing layouts, but future instances of that saved row, column, or module show the updated version. 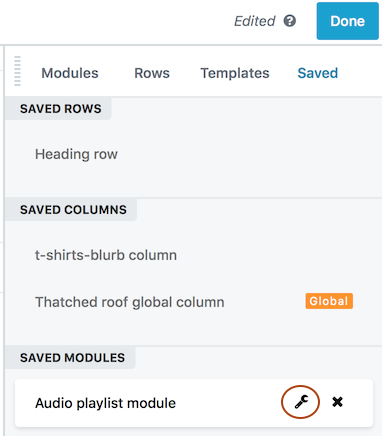 Updates the saved row, column, or module and updates all instances in your layouts. Save changes and exit Changes are saved and the editing tab closes. Saved changes appear when you open the saved item for editing again. The previous version appears if you add the saved item to your layout. When you want to finalize your update to the saved item, open it for editing and publish the changes. Changes are saved and the editing tab closes. Saved changes appear when you open the saved item for editing, but the synched layouts continue to display the previous version. When you want to finalize your update to the saved item, open it for editing, and publish the changes. Discard changes and exit Editing updates are discarded and the editing tab closes. Editing updates are discarded and the editing tab closes. Cancel Reverts to the tab with your current editing changes. Reverts to the tab with your current editing changes.